The Spice Drug or Synthetic cannabis is an herbal and chemical product which mimics the effects of cannabis. It is best known by the brand names K2 and Spice. When synthetic cannabis products first went on sale it was thought that they achieved an effect through a mixture of legal herbs. Laboratory analysis in 2008 showed this was not the case and that they in fact contained synthetic cannabinoids which act on the body in a similar way to cannabinoids naturally found in cannabis, such as THC. Synthetic cannabinoids, including cannabicyclohexanol, JWH-018, JWH-073, and HU-210, are used in an attempt to avoid the laws which make cannabis illegal, making synthetic cannabis a designer drug. It has been sold under various brand names, online, in head shops and at some gas stations. It is marketed as an incense or "herbal smoking blend", but the products are usually smoked by users. Although synthetic cannabis does not produce positive results in drug tests for cannabis, it is possible to detect its metabolites in human urine. The synthetic cannabinoids contained in synthetic cannabis products have been made illegal in many European countries, but remain legal under federal law in the USA. Several US states have made it illegal under state law. Synthetic cannabinoids are chemical compounds that mimic the effect of THC, the principle active ingredient of cannabis. Like THC, they bind to cannabinoid receptors in the brain and were initially developed as therapeutic agents for the treatment of pain. However, these psychoactive research chemicals are frequently being sprayed on herbal mixtures and sold as "fake weed" or "synthetic marijuana." JWH-018 and JWH-073 are the two most common synthetic cannabinoid chemicals found in a variety of herbal smoking blends. Others like JWH-250, JWH-081 and CP47, 497 have also started appearing in some products and preparations. Legal in most states, JWH-018 and JWH-073 are the two most popular synthetic cannabinoids used today. Reportedly offering a high 4 times stronger than marijuana, JWH-018 and JWH-073 are commonly associated with herbal smoke and incense products sold under names like K2, Spice, Serenity and others. 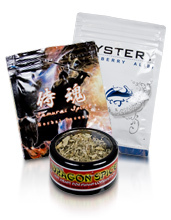 Synthetic cannabinoid chemicals are often laced in the herbal smoking products that are readily available via the Internet and in many "head-shops" around the country. Users looking for a "legal high" often turn to these herbal smoking or incense products because they do not show up on a standard urine drug test. Users smoke the product by wrapping joints, smoking it in pipes, or inhaling fumes via vaporizers. Users also report that herbal blends or pure chemical concoctions can be ingested with an infusion or solvent process; purportedly allowing them to manage the potency and dose of the active ingredient(s). Users looking for a "legal high" often turn to popular herbal smoking products marketed under brand names such as K2, K3, Spice, Genie, Smoke, Pot-pourri, Buzz, Pulse, Hush, Mystery, Earthquake, Ocean Blue, Stinger, Serenity and many others. OUR LAB maintains a composition and concentration list for different products, brands and preparations. What is the legal status of these chemicals? While legal under federal law, products containing JWH-018 and JWH-073 are banned in several states and by the U.S. armed forces. At present, JWH-250 is illegal in only one state. Legal restrictions on these compounds are likely to be imposed nationwide. Additionally, they are banned by a number of European countries, including Britain, France, Germany, Poland and Russia, as well as South Korea. The Drug Enforcement Administration (DEA) labeled them a "drug and chemical of concern" in 2009. Why are JWH-018 and JWH-073 tested by OUR LAB? OUR LAB laboratory analysis confirmed JWH-018 and JWH-073 as the primary active ingredients in 37 herbal smoking mixtures, and established test methods to identify the presence of their metabolites in urine. 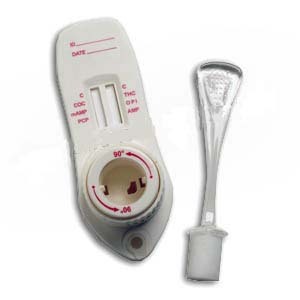 How long can JWH-018 and JWH-073 be detected in urine? The presence of metabolites in urine confirms ingestion of JWH-018 and JWH-073. JWH-018 and JWH-073 metabolites can be detected in urine up to 72 hours (depending on usage/dosage). How long can JWH-018, JWH-073 and JWH-250 be detected in oral fluid? Drugs in oral fluid can be detected from minutes up to 24-48 hours after ingestion. How is JWH-018 and JWH-073 metabolized in urine? Both JWH-018 and JWH-073 metabolize extensively in humans via oxidation and glucuronide conjugation. Depending on dosage, the hydroxylated JWH-018 and JWH-073 and the carboxylated JWH-018 metabolites can be detected up to 72 hours in urine. Parent drug excreted in human urine has not been reported. There are no cut-off levels for our Lab's Urine Synthetic Cannabinoid Test. Toxicology result reporting for JWH-018 and JWH-073 will indicate either *Detected* or *Not Detected. * The cut-off level for the oral fluid test is 0.5 ng/mL for JWH-018, JWH-073 and JWH-250. Will a standard drug test detect synthetic cannabinoids? Conventional drug test panels will not detect the broad range of synthetic cannabinoids. They pass undetected in standard urine or oral fluid testing for such drugs as cocaine, marijuana, heroin and amphetamines. Our Labs Urine or Oral Fluid Synthetic Cannabinoid Test can be ordered with your standard panel to ensure detection. How accurate and reliable is the our LAB Urine Synthetic Cannabinoid Test? Our Lab's test will utilize the most sophisticated, sensitive and specific equipment and technology available, LC/MS/MS (liquid chromatography/mass spectrometry/mass spectrometry) to confirm JWH-018 and JWH-073 urine metabolites. To reduce false-negative results, the detection method relies on monitoring multiple metabolites for each of the compounds. Other labs that only look for the parent drug in urine will report many false negative results. Our Lab's test methodology provides the most definitive synthetic cannabinoid biomarker test results. How accurate and reliable is the our LAB Oral Fluid Synthetic Cannabinoid Test? Our Lab's test utilizes the most sophisticated, sensitive and specific equipment and technology available, LC/MS/MS (liquid chromatography/ mass spectrometry/mass spectrometry) to confirm JWH-018, JWH-073 and JWH-250 in oral fluid. Drug Abuse That Is Legal (in some states)! There's a drug popular with teens in the U.S. that many parents may never have heard of, but worst of all - it is legal (in most states). This drug, called Spice or K2 is said to give the user a marijuana-like high. Sold in shops and online as incense, it is being smoked as a legal alternative to marijuana. But this drug appears to have far more dangerous side-effects and without the necessary regulation, consumers have no idea what they're really getting. Until recently, the only way to test for the use of Spice is by lab spice drug testing. Now, we have Rapid Spice Drug Tests! Theoretically, children under the age of 18 cannot buy the drug, as head shops and online stores are not supposed to sell to minors. As this drug is still legal in the U.S., many people may be led to believe that it is a safe alternative to marijuana. This could not be further from the truth. Parents, teachers, and lawmakers need to be made aware that this drug is out there and that it has the potential to harm the lives of our children. 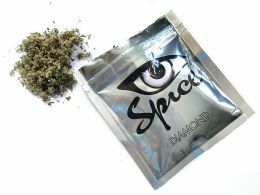 According to the Psychonaut Web Mapping Research Project, synthetic cannabis products, sold under the brand name Spice first appeared in Europe in 2004. The brand "Spice" was released in 2004 by the now dormant company The Psyche Deli in London, UK. In 2006 the brand gained popularity. According to the Financial Times the assets of The Psyche Deli rose from $65,000 in 2006 to $899,000 in 2007. The EMCDDA reported in 2009 that Spice products were identified in 21 of the 30 participating countries. Because 'Spice' was the dominant brand until 2009, the competing brands that started to appear from 2008 on, were also dubbed 'Spice'. Spice can therefore relate to both the brand 'Spice', as to all herbal blends with synthetic cannabinoids added. A survey of readers of Mixmag in the UK in 2009, found that one in eight respondents had used synthetic cannabis, compared to 85% who had used cannabis. Synthetic cannabis is claimed by the manufacturers to contain a mixture of traditionally used medicinal herbs, each of which supposedly produces mild effects with the overall blend resulting in the cannabis-like intoxication produced by the product. Herbs listed on the packaging of Spice include Canavalia maritima, Nymphaea caerulea, Scutellaria nana, Pedicularis densiflora, Leonotis leonurus, Zornia latifolia,Nelumbo nucifera and Leonurus sibiricus. However, when the product was analysed by laboratories in Germany and elsewhere, it was found that many of the characteristic "fingerprint" molecules expected to be present from the claimed plant ingredients were not present. There were also large amounts of synthetic tocopherol present. This suggested that the actual ingredients might not be the same as what was listed on the packet, and a German government risk assessment of the product conducted in November 2008 concluded that it was unclear what the actual plant ingredients were, where the synthetic tocopherol had come from, and whether the subjective cannabis-like effects were actually produced by any of the claimed plant ingredients or instead might possibly be caused by a synthetic cannabinoid drug. In January 2009, researchers at the University of Freiburg in Germany announced that an active substance in Spice was an undisclosed analogue of the synthetic cannabinoid CP 47,497. Later that month, CP 47,497 along with its dimethylhexyl, dimethyloctyl and dimethylnonyl homologues, were added to the German controlled drug schedules. In May the analogue of CP 47,497 was named cannabicyclohexanol. In July 2010, it was announced that JWH-018 is one of the active components in at least three versions of Spice, which had been sold in a number of countries around the world since 2002, often marketed as incense. Another potent synthetic cannabinoid, HU-210, has been reported to have been found in Spice seized by U.S. Customs and Border Protection. An analysis of samples acquired four weeks after the German prohibition of JWH-018 took place found that the compound had been replaced with JWH-073. 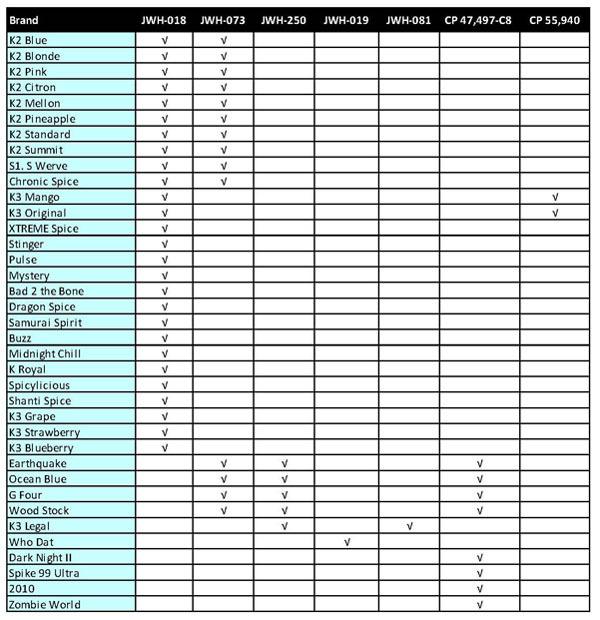 Different ratios of JWH-018 and CP 47,497 and their analogues have been found in different brands of synthetic cannabis and manufacturers constantly change the composition of their products. The amount of JWH-018 in Spice has been found to vary from 0.2% to 3%. No official studies have been conducted on its effects on humans. Though its effects are not well documented, extremely large doses may cause negative effects that are generally not noted in marijuana users, such as increased agitation and vomiting. Professor John W. Huffman who first synthesised many of the cannabinoids used in synthetic cannabis is quoted as saying, "People who use it are idiots." "You don't know what it's going to do to you." One study reported a single patient exhibiting withdrawal symptoms and another, psychosis. Spice / K2 testing is available by spice urine drug test or spice saliva drug test. Spice does not cause a positive drug test for cannabis or other illegal drugs using GC-MS-screening with library search, multi-target screening by LC-MS/MS, or immunological screening procedures. A study has been conducted into the detection of metabolites of JWH-018 in urine, the metabolites are mainly conjugates with glucuronic acid and can be reliably detected by GCMS/MS and LCMS/MS. Following cases in Okinawa and Japan involving the use of synthetic cannabis by Navy, Army and Marine Corps personnel resulted in the official banning of it, a punitive general order issued on January 4, 2010 by the Commander Marine Corps Forces, Pacific prohibits the actual or attempted possession, use, sale, distribution or manufacture of synthetic cannabis as well as any derivative, analogue or variant of it. On June 8, 2010, the U.S. Air Force issued a memorandum that banned the possession and use of Spice, or any other mood-altering substance, among its service members.